One of the more intriguing 20th century U.S. stamps is the 3-cent deep violet coil stamp of 1911, vertically perforated 12, Scott No. 389. This stamp is listed by the Scott Specialized Catalogue of the United Slates Stamps as first issued on January 24, 1911. However, the earliest known cover is dated April 27, 1911. The actual quantity of stamps issued is unknown, but it is thought to be more than one coil of 500 and less than 223,500 stamps. The figure 223,500 represents the total of all 3-cent coil stamps made in 1911, including the number of Scott No. 394 (perforated 81/2). 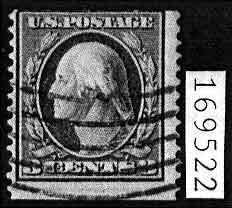 Students believe that the perforated 81/2 coil stamp accounted for the bulk of the coil stamps made in 1911. Even in 1913 (two years after we know the stamps were placed into use), there was considerable controversy and question over whether the stamp existed, until one by one collectors wrote to Mekeel’s Weekly Stamp News and similar periodicals to state they possessed a used example. Finally, the stamp became accepted by the cataloguers at Scott Publishing Company and included in their listings. We know that the 3-cent coil stamps from this period do not exist on double-line watermarked paper. A letter from A. M. Dockery (third assistant postmaster) states no coil stamps were produced by the Post Office Department on such paper. The few examples that do exist on double-line watermarked paper are either outright fakes or have private perforations attributed to the International Vending Machine Company. These private perforations would have been made by a company that had gone out of business by the time these stamps were first printed. During the early years of The Philatelic Foundation, its Expert Committee refused to certify coil singles because the committee felt it was too difficult to determine their authenticity. However, over the years the study of coils has expanded and evolved to the point where the Expert Committee has felt for some time that coil singles can be authenticated, especially Scott No. 389. This stamp is a popular submission with a total of 272 certificates issued over the years. These 272 certificates describe 154 different stamps found to be genuine, 107 found to be fake, and one Scott No. 493 (rotary press printing). The genuine include 124 used singles (seven on piece), two used strips of three (one on piece, one off piece), four unused pairs, one unused strip of five, and 11 of the 15 known covers. Among the fake are 59 used singles, two used pairs, one used strip of three, 19 unused pairs and three covers. To date virtually all used examples certified as genuine have a distinctive wavy-line machine cancellation, normally used on first class mail. The correct first class mail rate in 1911 was 2 cents, and the stamp typically used was the 2-cent carmine stamp. Therefore, few 3-cent stamps would have received this kind of cancellation. However, the two certified used strips of three have the circular date stamp of Orangeburg, N.Y. These two strips were probably used on packages that could not pass through the first class canceling machine. This coil stamp comes in a very unusual deep shade that is different from the color of the sheet stamp. Unfortunately, color is one thing that is impossible to describe in writing and can be seen only when comparing the stamp in question to known genuine examples. Many experts feel that this coil should be 23.5 mm. to 24.5 mm. tall. This size is slightly smaller than the expected size for other flat plate coils of the period, which are 25 mm. tall. A recent measurement of 14 authenticated examples showed a range of 23.5 mm. to 24.2 mm. These three criteria should be used only when comparing the stamp in question to known genuine examples and not to a stamp by itself.